Canning salsa with fresh ingredients. It was the summer of bumper crops in the Nutmeg Disrupted gardens. By gardens, I mean flower beds and numerous containers. The “garden garden” was covered with grass a few years back because of time constraints with work and travel. I miss my garden. The original garden I first started with turned into a 4000 square foot growing oasis. I had huge tubs set around the perimeter to collect rain and to help make the task of watering not quite such labor intensive work. And it was easier on the well Each row was mulched with layers of newspaper which I then covered with a thick layer of freshly cut grass, which was topped up weekly. I was cutting 7 acres so there was always a fresh supply. Then in the fall the garden would be put to bed for the winter with a thick layer of leaves. The complete farm was surrounded by trees, by time you raked and loaded the 20th truckload you stop counting! Then in the sping a farmer from over by Radway would come with his magic tractor sized tiller and for $30 turn it all into 2 feet deep of pure black gold! Gosh I miss that garden! But downsizing does not mean you can not have success. With a bit of creativity and good gardening practices you can have a fantastic harvest from limited space. I start my seeds under lights in the winter. Being in northern Alberta I like to get a bit of a jump on the growing season. Espically for things like peppers, tomatos and celery. My growing season is relatively short and you never know if those super hot temperatures will be acheived so the more mature the plants are the better success for a bountiful harvest is possible. This year I grew tomatos in containers and in the 2 flower beds out back. It was an extremely early Spring followed by a record breaking summer. And my garden showed it. Off of 8 tomato plants I harvested well over 100 pounds of tomatos. The salsa recipe is a combination of a few recipes. Having never made salsa before I am extremely impressed with how it turn out. The depth of flavor is just fantastic. Tangy and smokey with a nice freshness to it. I did a few different takes on the recipe making one mild and one with a nice kick of heat. If you have a food processor do use it to chop the hot peppers. Beware of the pepper fumes when removing the lid if the processor. If you are chopping by hand wear gloves if you can. If not be aware of the hot pepper oils on your skin. Wash immediately after prep. Hot pepper oils can burn. 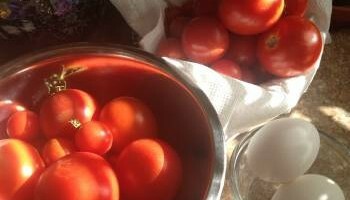 Place the chopped tomatos into a colander over a bowl. Allow to drain for 15 minutes to remove some of the tomato water. You would be suprised at how much water you collect. In a large pot combine all the ingredients and stir well to mix completely. Slow simmer for up to 2 hours on medium heat stirring occasionally. Cook until desired flavor and consistancy is acheived. Ladle the salsa into hot jars. Clean the rims of the jars with a clean cloth. Add rings and tighten until just finger tight. Place all the filled jars into a hot water bath and process for 20 minutes. Allow to cool. Previous Post - Previous post: Cookies made with Canola Oil. Iced Almond Gems. I’m not in a position to can this much stuff right now but once I am home, I’d love to can my own salsa! LOVE! Thank you for your comments. I have since moved so I am strictly container gardening this year. Hoping to expand on that new spring if I can. Thanks Sean! This recipe is jam packed with flavour, I am sure you will enjoy it very much. Indeed my gardens have evolved over the years but one thing remains constant, my need to grow my own food! What started out of desperation (you can read about it in my Blank State post) have been one of my most loved passions! Again this year I have a container garden and it is thriving in the fantastic weather we have had this summer. Let me know of you try the salsa! Have a great rest of the weekend. Canning can be kinda scary until you learn the basics but definitely worth learning. I always suggest starting with jams for your first time, there are a few posted here with steps for exactly what you need to can and how to make jam. It is small scale canning that allows you to learn without all the work. The kiwi jam I just posts is fantastic, maybe start there. If you eve have any questions feel free to ask, I have been canning for 20 years. Agreed Melissa! I am definitely a convert since I have started making it. I would still love to be on that land with that garden, it was my pride & joy! Everything I know about growning food I learnt on that garden and the hard work became a bit of therapy when my youngest son passed away. It was exactly where I needed to be. Love that even being downsized I can still grow a good sized crop. Fingers crossed for another bumper crop year! Very nice garden and nice Salsa. I make fresh salsa all summer long from my garden but have never thought of canning it! Looks great! I make salsa often but have never canned it – to be honest canning kinda scares me! Perhaps i’ll give it a go once my tomatoes are ripe! Homemade salsa is the best! Always on the hunt for new recipes. Will definitely be trying this once my tomatoes are ripe. There is no comparison to homemade salsa. Hands down it is the best! We make it every year. Wow! I’m not surprised you shut down that big garden. It must have been a lot of work! It looks like your current, smaller one is quite productive anyway! Thank you for the salsa recipe. I have a question, I just made this and it is delicious! I am wondering if I need to keep the honey in it, or can I reduce it. Thanks again for the recipe!